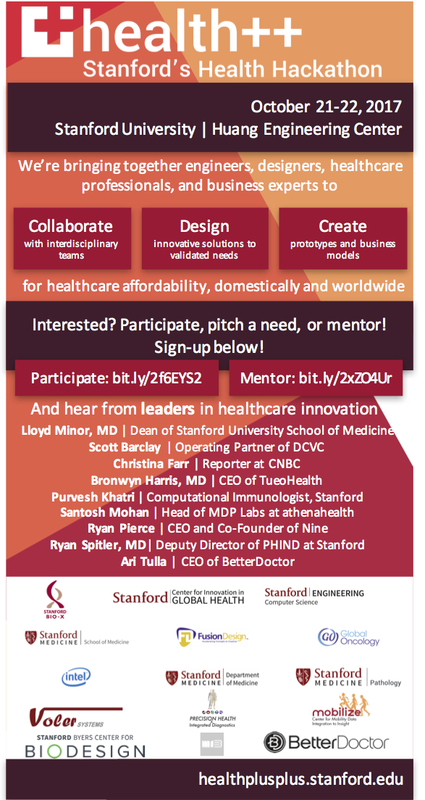 health++ HACKATHON: APPLY NOW - GLOBAL ONCOLOGY, INC.
On the weekend of Oct. 21-22, 2017, health++ is bringing together medical professionals, engineers, designers and business experts to build innovative prototypes and business models to tackle challenges in healthcare affordability. 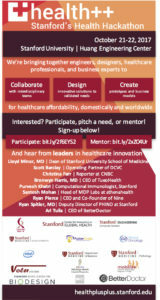 At the opening and closing ceremonies, participants will have the chance to hear from Lloyd Minor, MD (Dean of the Stanford University School of Medicine) and other leaders in healthcare innovation. Following problem pitching, participants will form interdisciplinary teams and spend the weekend tackling a validated need, ultimately presenting to a panel of esteemed judges. At last year’s hackathon, from the initial 50 needs that were presented, 40 projects were submitted, and $7500 in prizes were awarded. All projects have been made publicly viewable at Devpost. For additional information on last year’s event, feel free to check out coverage by Stanford News and the Scope Medicine blog. Sound interesting? Whether you want to participate or pitch a need, fill out the general application here. Applications will close on Saturday, Sep. 30 at 11:59 PM. Learn more at our website healthplusplus.stanford.edu, or drop us a line at healthplusplus-team@lists.stanford.edu.